Making your own soap is an interesting and useful hobby. It allows you to create soaps of any size, shape, color and fragrance. Homemade soaps may also contain any ingredients that you enjoy, such as moisturizers or medicinal herbs. There are different methods for making soap, and each method requires a few specific ingredients to ensure the soap turns out correctly. This method of making soap is the most traditional. 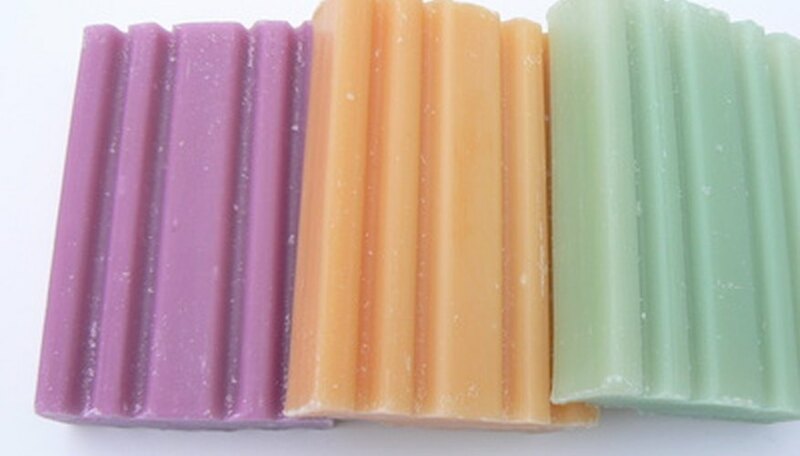 Cold process soap is very hard and lasts a long time. It is made through the careful combination of fatty acids (which can be any oils you choose) and sodium hydroxide (which is lye). The ingredients are combined at high temperatures, then allowed to cure (or age) for several weeks to allow the soap finish. This is a very tricky method of making soap, and it is best done by a soap maker with some experience. This method also requires the use of safety equipment such as gloves, goggles, long sleeves and other protective clothing. Hot process soap-making is a more advanced version of cold process soap making. This method should definitely not be attempted by anyone but experienced soap makers. It uses the same ingredients as cold process soap making, but rather than combining the ingredients and allowing them to cure over several weeks, the ingredients are combined and cooked at various high temperatures to cook out the excess water. Once the soap cools off, it is ready to be used. This is possibly the most simple way to make soap, and it is the perfect method for beginners and children. This method requires the use of a soap base, which is a pre-made, basic soap with or without additives such as colors or fragrances. The soap base is melted, and additional ingredients, such as essential oils, herbs, colors, fragrance oil or glitter or mica for sparkle, are added to the base. The base is then poured into soap molds and allowed to harden. The solidified soap is then ready to use. Rebatching is another simple soap-making method. It involves using old bits of soap, chopped and rehydrated with water, oils and milk. Once the old bits of soap are liquefied with the new ingredients, additives such as fragrance oils, essential oils, herbs or colorants may be added. The soap is then poured into molds and allowed to harden. Once solidified, the soap is ready for use. All Crafts: Hot Process Soap - From Scratch!